One of my favorite foods is mushrooms. I can’t put enough of them in my spaghetti sauce. They are amazing on pizza. 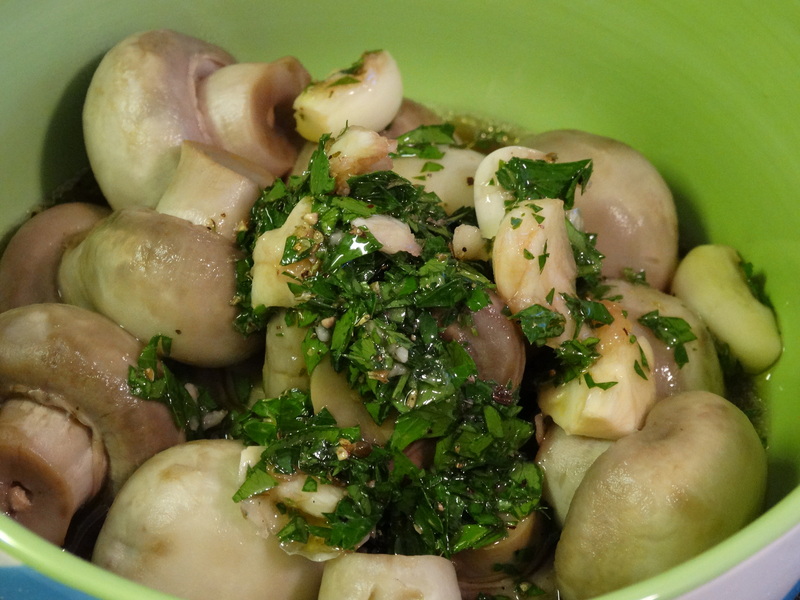 But what could be better than just the mushrooms themselves marinated in vinegar, garlic, and spices? Some of you who don’t care for mushrooms might be thinking that anything would be better than marinated mushrooms, but to each their own! I have to give credit for this yummy appetizer to my friend, Sarah’s, mother. Sarah made these for a dinner party once several years ago and I had to get the recipe. Since then, I have often them made when we’ve had guests over. The name “Devil’s Fungus” came from my cousin, Wendy, who hates mushrooms. Thank you both! This is a great recipe that doesn’t take much work. 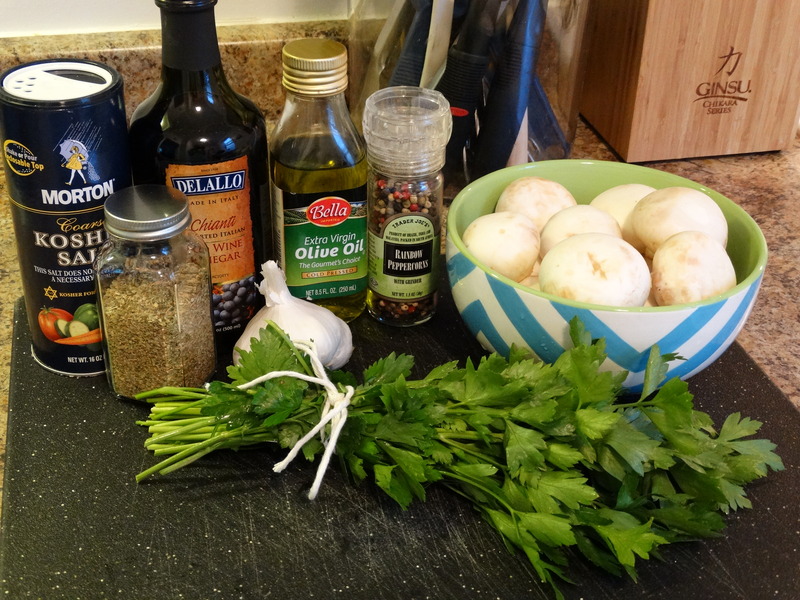 You will need one pound fresh white mushrooms, coarse salt, fresh ground pepper, chopped parsley, oregano, red wine vinegar, olive oil, and garlic. Start by washing your mushrooms to remove any dirt. Place them in a large sauce pan filled with water and a bit of salt. I use about a teaspoon. Turn the burner on high and let them boil until they are cooked through. 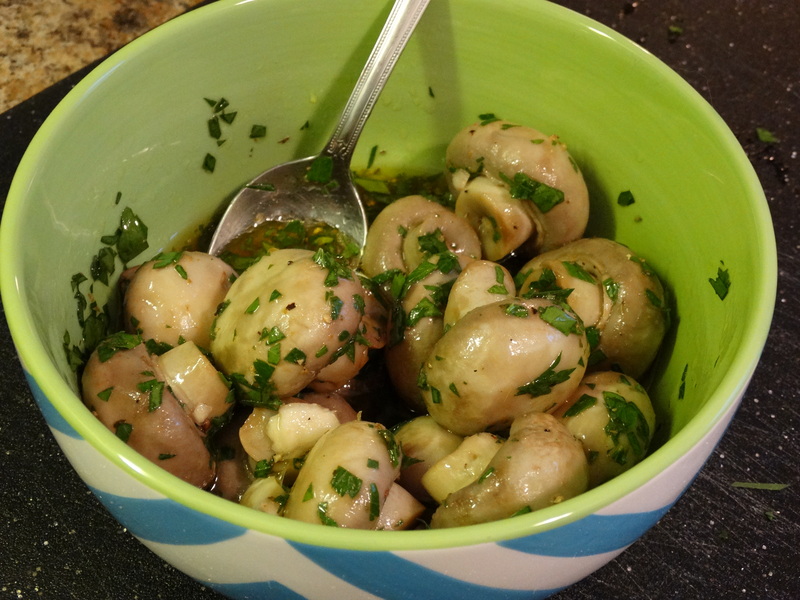 While the mushrooms are boiling, chop one tablespoon fresh parsley and peel and crush a clove or two of fresh garlic. 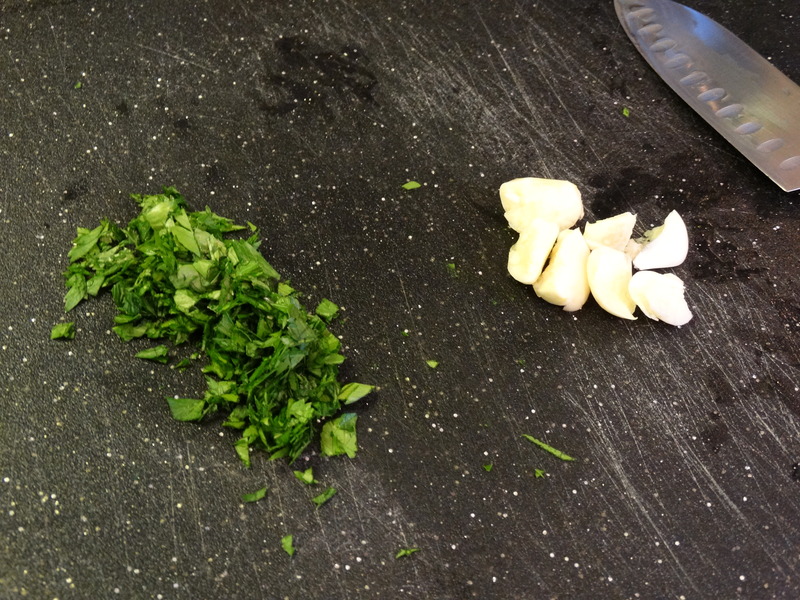 If you have trouble with the garlic sticking to your hands while handling it, try wetting your hands and knife. It helps cut the stickiness! Combine 1/4 cup red wine vinegar, 2 tablespoons olive oil, 1/2 teaspoon coarse salt, 1/4 teaspoon dried oregano, a dash of fresh ground pepper, the chopped parsley, and crushed garlic with a whisk. 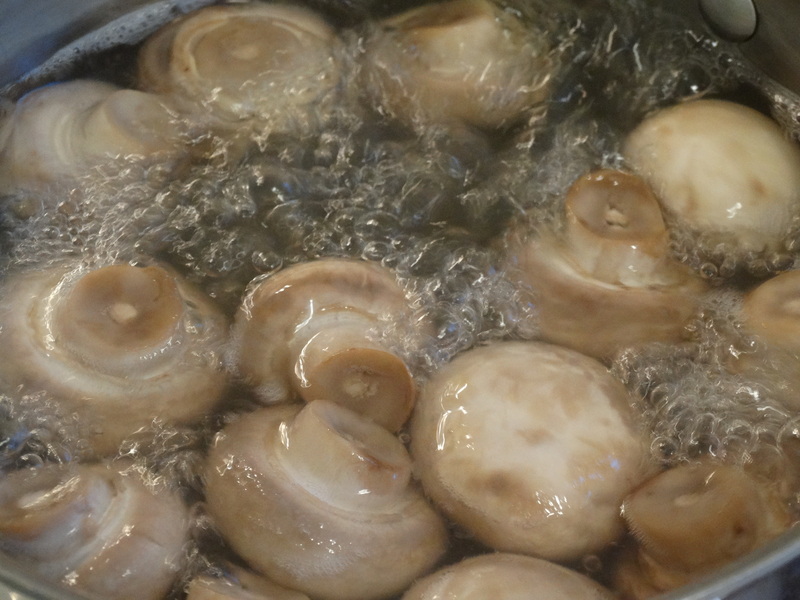 When the mushrooms are cooked, drain them and cool under cold water. The cooking time will vary depending on the size of your mushrooms. Mine were on the large side, so I boiled them for about 35 minutes. Put your mushrooms into a small bowl. Make sure there is enough room to stir them without spilling any of the delicious marinade. Pour the marinade over the top. Transfer them to your favorite serving dish and enjoy! You can serve them right away, but I recommend letting them marinate in the refrigerator for a few hours or even overnight. The longer they have to absorb the flavors, the better they taste! 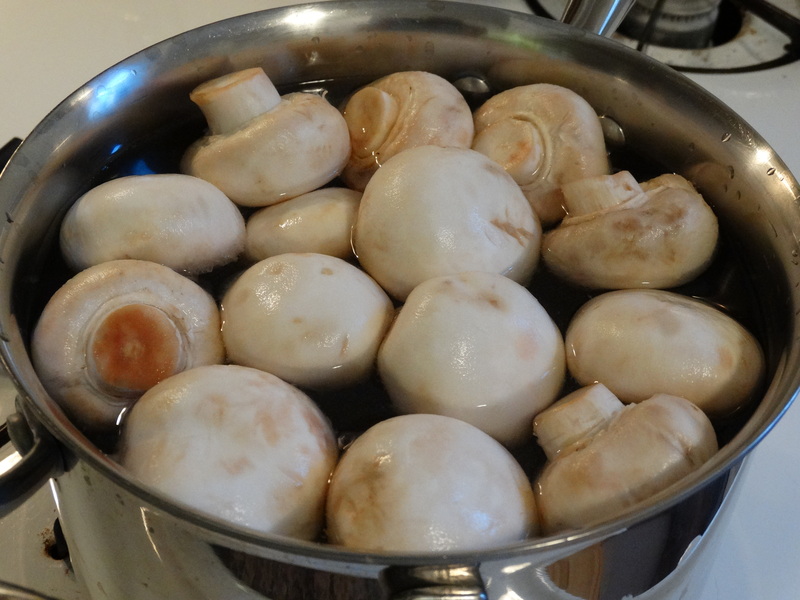 1) Wash one pound of fresh whole white mushrooms and boil them in salted water until cooked through. 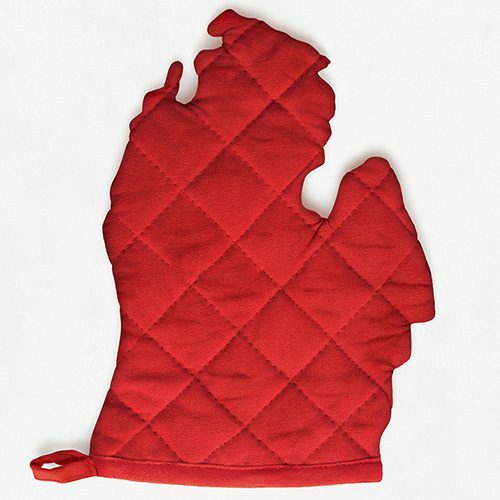 2) Using a whisk, combine 1/4 cup red wine vinegar, 2 tablespoons olive oil, 1/2 teaspoon coarse salt, 1/4 teaspoon dried oregano, a dash of fresh ground pepper, 1 tablespoon chopped parsley, and 1 or 2 cloves crushed garlic. 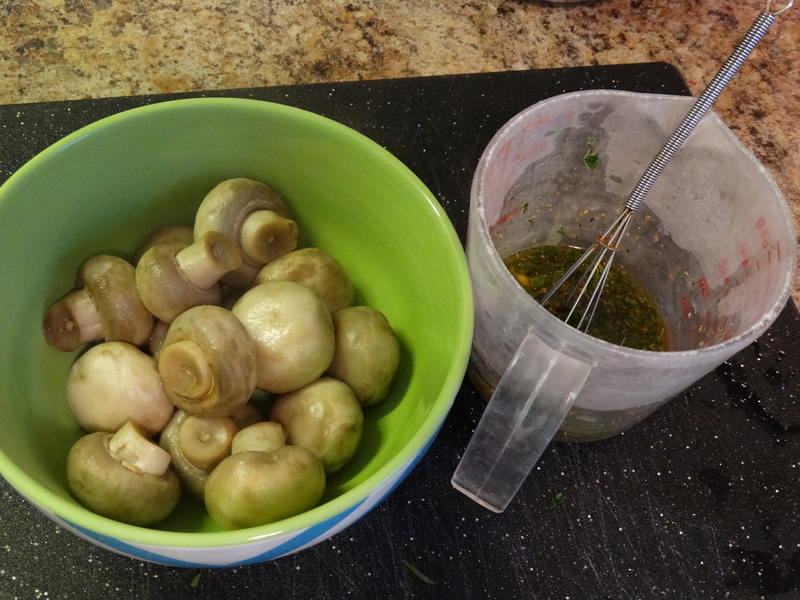 3) Drain and cool the mushrooms. Place them in a small mixing bowl. Pour the marinade over them. Gently stir to combine. Cover and refrigerate for a few hours or overnight before serving. Enjoy! Yum! Much to my Mom’s chagrin, we called these Grandma’s Mushrooms when I was growing up. I’m digging Wendy’s updated name. Love the blog, miss you!